Studio Line - Eyes 12pc. 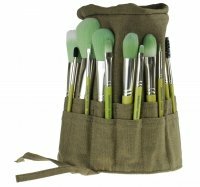 Brush Set by Bdellium tools. Set for professional eye make-up. Made of blends of natural and synthetic bristles arranged in metal caps resistant to damage and deformation. Handles were made of wood and painted yellow. The handles do not slide out of hand, providing comfort of use. Be sure to regularly wash your brushes to keep your make-up accessories in perfect condition. To clean the brushes use a small amount of shampoo, create foam, rinse with water, squeeze and leave to dry on a towel. Perfect for home use and traveling. The set comes with a folded case. - 785S - Studio Line Tapered Blending. Designed for grinding and mixing shadows. Dimensions: bristles length 2 cm, handle length 15,6 cm, total length 17,6 cm, bristles span 1.2 cm. Type of bristles: synthetic. - 780S - Studio Line - Pencil. Designed for grinding shadows on eyelids or applying along lash lines. Perfectly suited for blending, as well as applying eyeliner, or grinding crayons. Dimensions: bristles length 1,1 cm, handle length 15,5 cm, total length 16,6 cm, bristles span 0.6 cm. Type of bristles: natural, synthetic. - 778S - Studio Line - Large Shadow. Brush for applying eyeshadows of any kind (loose, pressed, creamy). Dimensions: bristles length 1.5 cm, handle length 15.6 cm, total length 17.1 cm, bristles span 1.3 cm. Type of bristle: natural, synthetic. - 776S - Studio Line - Blending. Brush for shading and combining colors, applying loose and cream cosmetics. Perfectly combines lines of different colors and supports precise application. Dimensions: bristles length 1.5 cm, handle length 15.5 cm, total length 17 cm, bristles span 1.1 cm. Type of bristles: synthetic. - 772S - Studio Line - Small Shader. 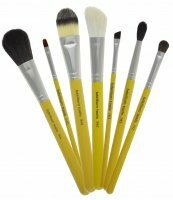 Brush for applying mineral cosmetics as well as cosmetics in stone and cream. Perfectly combines shadows on eyelids and enables you to comfortably apply concealer. Dimensions: bristles length 0.9 cm, handle length 15.5 cm, total length 16.4 cm, bristles span 0.8 cm. Type of bristles: natural, synthetic. - 766S - Studio Line - Angled Shadow. Brush for applying shadows to the upper and lower eyelid, as well as creating 'Smoky Eye' effect. Dimensions: bristles length 0.9-1.4 cm, handle length 15.5 cm, total length 16.9 cm, bristles span 1 cm. Type of bristles: natural. - 763S - Studio Line - Small Angle. This brush allows you to accurately and precisely draw lines on eyelids or in eyebrows. The shape of the brush allows you to create lines of different lengths and thicknesses. Dimensions: bristles length 0.5 - 0.8 cm, handle length 15 cm, total length 15.8 cm, bristles span 0.7 cm. Type of bristles: synthetic. - 760S - Studio Line - Liner / Brow. Brush for applying fine lines on lash lines and in eyebrows. The right shape and size enables you to draw lines of different shapes, thicknesses and lengths. The product allows you to apply high-glow, creamy shadows to your eyelids. Perfect for applying shadows under eyebrows. Dimensions: bristles length 0.4 - 0.5 cm, handle length 14.9 cm, total length 15.4 cm, bristles span 0.3 cm. Type of bristles: synthetic. - 755S - Studio Line - Smudge. Brush for applying, grinding and smudging shadows. It's a great tool for creating Smoky Eye make-up. Dimensions: bristles length 0.6 cm, handle length 15.7 cm, total length 16.3 cm, bristles span 0.6 cm. Type of bristles: synthetic. -733S - Studio Line - Lash. Brush for eyebrow styling, eyelash combing and applying mascara. Dimensions: spiral length 2.5 cm, handle length 14.7 cm, total length 17.2 cm, bristles span 0.7 cm. Type of bristles: synthetic. - 714S - Studio Line - Flat Eye Definer Brush for applying fine or thick lines with eyeliner. Perfect for wet applying shadows. Dimensions: bristles length 0.7 cm, handle length 15.6 cm, total length 16.3 cm, bristles span 0.9 cm. Type of bristles: synthetic. - 710S - Studio Line - Eye Liner. Brush for emphasizing lash lines on the upper and lower eyelids. Dimensions: bristles length 0.8 cm, handle length 14.7 cm, total length 15.5 cm, bristles span 0.3 cm. Type of bristles: synthetic.